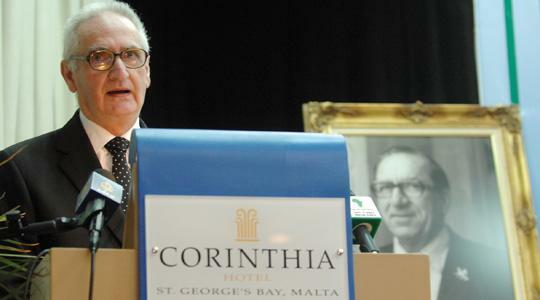 Dom Mintoff yesterday sent Karmenu Mifsud Bonnici to pick up the Al-Gaddafi Prize for Human Rights in his stead, with a note of apology saying he was too sick to attend. The former prime minister may be 92, but he can still lure crowds. Last night a packed hall waited with bated breath to see whether Mr Mintoff would be there in person. Instead, Dr Mifsud Bonnici, his deputy in 1980 and eventual successor, read out a handwritten note from Mr Mintoff addressed to Ahmed Ben Balla, Algeria's first president and organising committee chairman. The note read: "Dear comrade... my colleague (Dr Mifsud Bonnici) is familiar with my handwriting if you need help in understanding the letter. Please accept my apologies for my absence, but when you visited me (on Saturday at home) you had fresh evidence of my present state of health." Reading out his letter, Dr Mifsud Bonnici joked that it was not the first time he was deputising for Mr Mintoff: "I think it's my destiny to stand in for him." A gilded frame of Mr Mintoff in his heyday stood high in the background, seemingly keeping a close eye on Dr Mifsud Bonnici while he received the medal and $250,000-prize to loud applause. The prize, which in past years has been presented to Nelson Mandela, Fidel Castro, and Hugo Chavez, was awarded to Mr Mintoff in "appreciation of his struggle for the independence of Malta". It also acknowledged Mr Mintoff's endeavours to rid the Mediterranean of war fleets and nuclear weapons to make way for security, peace and prosperity. Dr Mifsud Bonnici said Mr Mintoff planned to use the prize money to set up a fund to build and promote a global movement for peace. "I never dreamt I would be asked to accept this award on his behalf, and on behalf of Malta," Dr Mifsud Bonnici said. "I cannot praise his achievements enough, but if he were here he wouldn't have wanted me to do that. But, I cannot fail to remark that if there is one Maltese personality who has contributed to the building of the nation, then that person is Mintoff. "He deserves our gratitude and I'm sorry to remark that we have been parsimonious and trivial in recognising his contribution. The award is recognising what we haven't," a visibly moved Dr Mifsud Bonnici said. "Mintoff has been a controversial figure throughout his life, but this does not diminish what he has done, what he has striven to do, and what he has achieved." Mr Mintoff was renowned for his relationship with Libyan leader Muammar Gaddafi and last night's event at the San Ġorġ Corinthia Hotel, St Julian's, rekindled memories of the early days of friendship between the two countries. At the top of the stairs to the conference hall stood a large, framed photo of Mr Gaddafi, rekindling memories for some of Mr Mintoff's Cabinet members - Alex Sceberras Trigona, Joe Grima and Daniel Micallef - who were present for the event. Established in 1989, the prize is awarded to "international personalities, bodies or organisations that have distinctively contributed to rendering an outstanding human service, and achieved great actions in defending human rights, protecting the causes of freedom and supporting peace everywhere in the world".